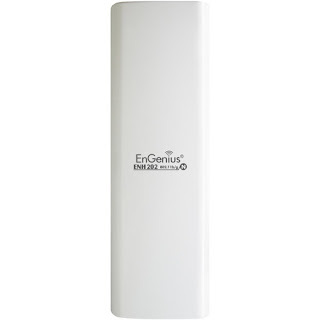 The ENH202 Wireless N 300MBps Access Point from EnGenius is a powerful access point designed to be used both indoors and outdoors. The two integrated Fast Ethernet ports provide a quality Ethernet connection while providing a wide variety of wireless network connectivity through 802.11 b/g/n standards. This access point utilizes the 2.412 – 2.472GHz frequencies on 11 operating channels. Once set up, you can take advantage of either infrastructure or ad-hoc modes allowing you to provide Internet connectivity as well as direct device to device connections. This versatile access point can serve a variety of purpose including outdoor Wi-Fi, outdoor wireless IP surveillance cameras, outdoor wireless signage, and point-to-multipoint communications.